June 8, 2017	/ 6.30 P.M.
With the Northern Expedition (1926-28), the Nationalist Party (GMD) emerged in China as the leading force for reunification of the country. The foreign powers had thus to face a new government in Nanjing that claimed back for China the sovereign rights it had lost with the ‘unequal treaties’ in the late Qing period. To Japan, in particular, the establishment of the Nationalist regime posed a threat to its ‘special interests’ in Northeast China. Historians have studied extensively the political process that in 1931 led to the Japanese invasion of Manchuria, taking into account both domestic conditions and the wider international context. Public opinion in Japan, however, has remained rather on the sidelines of research. The talk will examine Japanese press coverage of the Northern Expedition by focussing on three prominent themes. In the first place, the relationship between Nationalist and Communist Parties under the “United Front” in the initial stage of the campaign. Secondly, the issue of leadership and factional strife in the GMD. 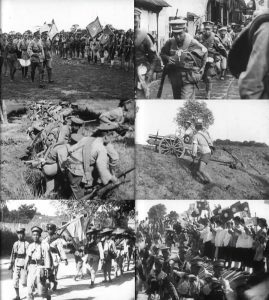 Finally, Japan’s military intervention in Shandong province, which led to the Jinan Incident in May 1928. Using a selection of sources representative of different political orientations and readership, the analysis will point at both divergent responses and widely shared opinions. While bringing to light the richness of public debate, evidence collected also suggests that flaws in the media system would later amplify the reasons for conflict between the two countries. Andrea Revelant is Assistant Professor in the Department of Asian and North African Studies of Ca’ Foscari University. His main research interests lie in the political and economic history of Japan. Recent publications include “Revolution Deconstructed: Chiang Kai-Shek and the Northern Expedition in the Japanese Press, 1926-28” (in De Giorgi and Samarani, eds, Chiang Kai-Shek and His Time, 2017); Economic Development and Inequality: the Fiscal Question in Modern Japan 1873-1940, 2016 (in Italian); “Rethinking Japanese Taxation in the Wake of the Great War” (in Frattolillo and Best, eds, Japan and the Great War, 2015). His current research is on the making of Nationalist China and Japanese public opinion in the 1920s and 1930s. His research stay in Japan is funded by Keio University’s SGUP (Super Global University Program).